It's impossible to import existing backup data on an updated iPhone through iCloud or iTunes, because Apple hasn't updated the iPad to iOS 12.1.2 yet. This is especially maddening for brand new iPad owners who only have iPhone data to import. The iPad doesn't need the phone-focused iOS 12.1.2 update... Only it does because now you can't import iCloud or iTunes backups from an iPhone into a new iPad if you've already updated to iOS 12.1.2 on the phone. "You're correct. You would not be able to restore a backup from an iOS version later than what's currently installed," according to Apple Support in a Twitter direct message to TechRadar. The fact that Apple nags you to update to iOS 12.1.2 on the phone and now defaults to auto-updates means that many iPhone owners who bought a new iPad are likely to have iOS 12.1.2 on their phone already without knowing it. 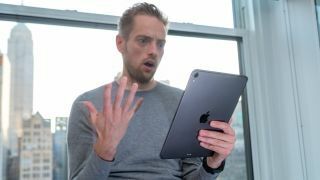 We tested this problem out on three different iPads, including a new iPad owner who didn't have any iCloud backups besides those from their iPhone. They didn't own an iPad previously, and bought the new iPad 9.7 due to the deeply discounted price over the holidays. A lot of novice users may be in the same boat. They weren't able to load up apps, photos, and messages from the get-go. Importing all of your old data between devices right from the start via iCloud is one of the best features Apple's mobile operating system has going for it. We did find a loophole that eventually solved this frustrating problem, but it required tapping into our $99 (about £79, AU$142) Apple Developer tool kit. We updated the iPad to the iOS 12.1.3 developer beta, leapfrogging the iOS 12.1.2 iPhone version, and we were then able to complete the iPhone data import to the iPad that way. That's obviously not a solution for everyone. Most people will have to wait for Apple to launch an iPad software update to match the iPhone software version number. Until then, they can set up their newly unwrapped iPad as a new device and re-download everything manually.